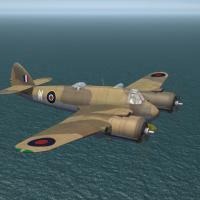 This is a the release of Veltro2K's =NEW= Lockheed/Vega Ventura Mk.II Bomber. 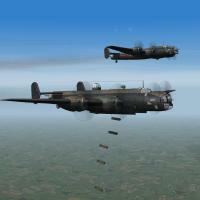 This represents the early "glass nosed" bomber version as used by the RAF in the ETO, with the Boulton-Paul turret. 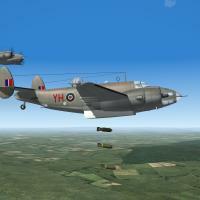 Although this mod is being released last, historically, the RAF Ventura's were in action FIRST! All markings are decals, and Decal Randomization is TRUE. Serial numbers are accurate for the model depicted, but should be considered 'generic' in nature, as they reprsent no specific unit. As has been the case, the other Ventura squadrons can be replicated by creating new squadron code letter decals. The various sounds and pilot figures are included. Weapons, guns, bombs, etc, are NOT; you should have them already. Operational service dates are rounded to 'whole months', and ARE relatively correct for in-theatre usages. As always, fairly easy to follow, yet detailed install instructions are included. PLEASE read them!!! This mod cannot be used in whole or in part of anything that is payware !!!! 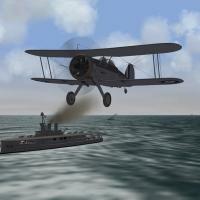 Here is a great looking Sea Gladiator built by Geezer and set up for StrikeFighters2. The default installation is for MTO but also included are a few additional files that can be added for ETO use. The installation is quite straight forward but make sure you READ the included README to understand the sound file installation. It's a small but additional hoop to jump through. Baffmeister: Flight Model and Ini Edits. AvHistory: Engine sound, modified by Baffmeister. the Gladitor was use in small numbers but its pilots made many acts of bravarie. 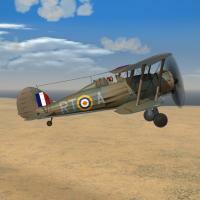 upload in Combat Ace freeware terms use it in any non paywere mod. This pack represents RAAF Beau TF.Xs, from late 1943 through the war's end. The Squadron Crest for each is used as the paint chip seen on the Loadout Screen. Skins are in jpg format. All markings are decals, and decal randomization is set to TRUE. As seen on the Loadout Screen, those letters marked with a star (*) have their serial numbers matched 100% to their plane-in-group letter. Those withOUT the star, while having served with 30 Squadron, could not be matched to their individual aircraft, but ALL are 100% historiclly correct, having served in this squadron. Many were lost on operations or accidents. All weapons, sounds, pilots, etc are included. On the Aircraft Selection Drop-down menu. The "CAF" (for Cocas Aircraft Factory) will diferentiate these Beaus from any others you may, or may not, have. As always, fairly easy to follow, yet detailed install instructions are included. So, please =READ= them BEFORE installing this mod!!!. Also, give the "Notes" section a read too. This mod represents the 4 Beaus used by the IDF's No. 103 squadron in late 1948. They had a VERY short service life, and this is reflected in the data ini. Operational dates are rounded to 'whole months'. Historically, there were 5 aircraft, one crashing before leaving England. I've given you 6 serial number decals, just because. 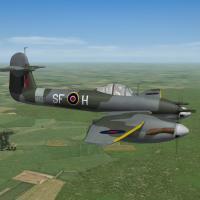 All markings, excepting the fuselage stripe, are decals and decal randomization is TRUE. This is a complete package, containing all "bits" necessary - weapons (bombs, rockets, rocket rails, drop tank) pilot figures, sounds and etc. Guns are not, as the 20mm cannon is a stock item. The torpedo capability has been removed, as research has turned up nothing even remotely mentioning it. Mission tasking in the data ini, and loadouts have been adjusted accordingly. This mod is designed to replace, in total, any and all earlier versions that are no longer available from "other sources". The may cause issues with existing campaigns (if any that use the Beau), but are easily fixed with the simple text edit of the campaign ini. *Note x2: This mod represents both early and late production Beau TF Mk.X for ETO and MTO** usage ONLY! Seperate versions for other theatres, will be released when and as they are finshed. **= will require new squadron code and/or individual aircraft letter decals. But the paint scheme is the same for MTO usage, in the aircraft lifespan/timeframe. However, SEAC/SoWesPac are completely different, and will require the release of "theatre specific" versions. This is a BRAND NEW aircraft, brought to you by Cocas Aircraft Factory & Co. 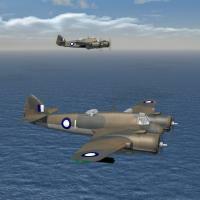 This package contains 2 complete aircraft, representing the Beaufighter TF Mk.X in both it's iterations. The TF Mk.X (Early) has the rear flex MG, no radar and no fin extension. The TF Mk.X (Late) is the final produciton verison, with thimble nose radar, rear flex gun, and the tail fin extension. The Squadron Crest is used as the paint chip seen on the Loadout Screen. Skins are in jpg format. Everything is included (weapons, pilot figures, sounds, etc), excepting the guns (you should have all these already). All markings are decals, and decal randomization is set to TRUE. Other squadrons can easily be reproduced by creating new squadon code letters (either for ETO or MTO usage). As is my habit, a sample bmp is left in the Decals folder so you can match the font and size. All serials, while correct for the variant depicted, should be considered 'generic' in nature, as they represent no specific aircraft with the unit(s) represented. on the aircraft selection drop-down for this aircraft. The "CAF" (for Cocas Aircraft Factory) will diferentiate these Beaus from any others you may or may not have. It =IS= designed to replace any other Beaus of this type from "other sources". *Note x2: This mod represents the late production Beau Mk.VIFs for ETO and MTO** usage ONLY! Seperate versions for other theatres, and the later marks, will be released when and as they are finshed. **= will require new squadron code and/or individual aircraft letter decals. But the paint scheme is the same for MTO usage. However, SEAC is completely different, and will require the release of a "theatre specific" version. This is a BRAND NEW aircraft, brought to you by Cocas Aircraft Factory & Co. 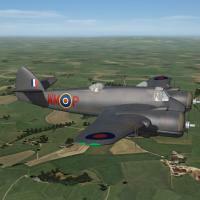 This package contains 1 aircraft, representing the Beaufighter VIF fighter/intruder variant. This version =HAS= the dihedral horizontial stabs (they point up), the rear swivel MG mount, and the "thimble nose" AI/ASV type radar. The aircraft IS equipped to carry rockets as well as 2 bombs on the wing stations - but, obviously! not all at the same time!! Torpedo capability has been removed for this "Fighter/Intruder" version. No. 604 Squadron "County of Middlesex"
The Squadron Crest is used as the paint chip seen on the Loadout Screen. Skins are in jpg format, as are the bump maps. Everything is included (weapons, pilot figures, sounds, etc), excepting the guns (you should have all these already). on the aircraft selection drop-down for this aircraft. The "CAF" (for Cocas Aircraft Factory) will diferentiate these Beaus from any others you may or may not have. It =IS= designed to replace any other Beaus of this type you may or may not have, from "other sources". The "thimble", of course, means this is the thimble-nosed radar equipped version (AI Mk.VIII). 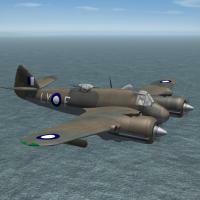 A few modificaitions (mostly a skin/decals set) for Cocas' Beau Mk.IC, 'Coastal Command' version as used in the Med. This is the complete aircraft. As seen in mid 41 thru late 43 time frames, based in Egypt and Malta. 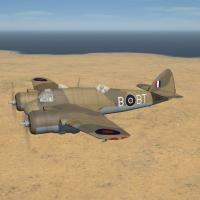 The aircraft is finished in standard Desert Day camo. Skins are in jpg format, as are the bump maps. Damage textures are in DDS. Everything is included, excepting the guns (you should have all these already). All markings are decals, and decal randomization is set to TRUE. All serials, while correct for the variant depicted, should be considered 'generic' in nature, as they represent no specific aircraft with the unit(s) depicted. for this aircraft. 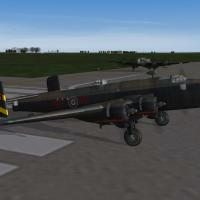 The "CAF" (for Cocas Aircraft Factory) will diferentiate these Beaus from any others you may or may not have. the Burma-India Theatre by the RAF. This is the complete aircraft. No. 99 Sqdn "Madras Presidency"
from June 1942 thru September 1944, when they requipped with Liberators. please read them. Also, give the "Notes" section a read too. The Avro Lancaster is a British four-engined Second World War heavy bomber designed and built by Avro for the Royal Air Force (RAF). 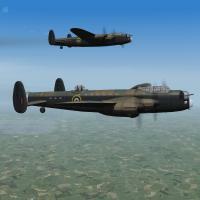 It first saw active service with RAF Bomber Command in 1942 and, as the strategic bombing offensive over Europe gathered momentum, it became the main heavy bomber used by the RAF, the RCAF, and squadrons from other Commonwealth and European countries serving within the RAF, overshadowing its close contemporaries the Handley Page Halifax and Short Stirling.The "Lanc", as it was affectionately known,thus became the most famous and most successful of the Second World War night bombers, "delivering 608,612 long tons of bombs in 156,000 sorties." This here is a BRAND NEW aircraft, brought to you by Cocas Aircraft Factory & Co. . 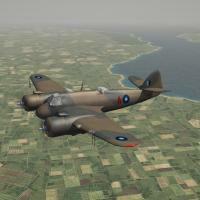 This package represents the late production Beaufighter NF Mk.1s. These marks =HAVE= the dihedral horizontal stabs (they point up). We are calling this "version 0.9", as there exists the possibility of more work being required. But, we wanted to get them out into the hands of our WW2 End Users  for their examination and so forth. Skins are in jpg format, as are the bump maps. Damage textures are in DDS. Everything is included, excepting the guns (you should have all these already). No bombs or rockets; these are NF Mk.1s, not equipped for them. However, I've allowed you other mission statements, in particular, Armed Recon. You've got plenty of 'gun power' for Truck Hunting. All markings are decals, and decal randomization is set to TRUE. It should be noted, that research has indicated varying numbers of NF Mk.1s arriving in India - some sources say 6, some 8, some 12. I've taken the lazy mans way out, and given you the 'generic' 26 plane-in-group letters. In Real Life , Mk. VI, Mk.X and TF Mk.X began arriving in theatre sometime in mid-late 1943. All serials, while correct for the variant depicted, should be considered 'generic' in nature, as they represent no specific aircraft with the units represented. for these aircraft. The "CAF" (for Cocas Aircraft Factory) will diferentiate these Beaus from any others you may or may not have. 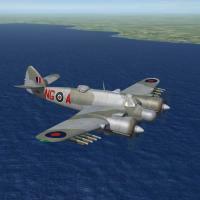 The Short Stirling was the first four-engined British heavy bomber of the Second World War. The Stirling was designed and built by Short Brothers to an Air Ministry specification from 1936, and entered service in 1941. 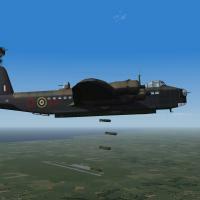 The Stirling had a relatively brief operational career as a bomber, being relegated to second line duties from 1943 onwards when other four-engined RAF bombers, specifically the Handley Page Halifax and Avro Lancaster, took over its role, but fulfilled a major role as a glider tug and resupply aircraft during the allied invasion of Europe in 1944-1945. 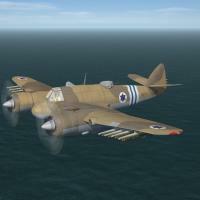 This is a BRAND NEW aircraft, brought to you by Cocas Aircraft Factory & Co.
As seen in late 1942/early 43 time frames. The aircraft is finished in standard overall MSG with disruptive Dark Green. Skins are in jpg format, as are the bump maps. Damage textures are in DDS. Everything is included, excepting the guns (you should have all these already). No bombs or rockets; these are Mk.VIF NFs, not equipped for them. All markings are decals, and decal randomization is set to TRUE. Other squadrons can easily be reproduced by creating new squadron code letters. As is my habit, sample bmps are left in the various Decals folders so you can match the font and size. *This mod will =NOT= work in SF/Wo* 1stGen game installs, at any patch level. all at the same time!! (see notes for more information). Skins are in jpg format, as are the bump maps. Damage textures are in DDS. should have all these already). folder so you can match the font and size. "Notes" section a read too. These are BRAND NEW aircraft, brought to you by Cocas Aircraft Factory & Co. This is the third of a set of Beaufighters. This package contains 3 aircraft, representing the both early & late production Beaufighter Mk.1F & the early NF Mk.1Fs. Skins are in jpg format, as are the bump maps. Damage textures are in DDS. Everything is included, excepting the guns (you should have all these already). No bombs or rockets; these are Mk.1s, not equipped for them. All markings are decals, and decal randomization is set to TRUE. New Hangar and Loading screens for each are included. for these aircraft. The "CAF" (for Cocas Aircraft Factory) will differentiate these Beaus from any others you may (or may not) have. These are BRAND NEW aircraft, brought to you by Cocas Aircraft Factory & Co.
=HAVE= the dihedral horizontal stabs (they point up). Users  for their examination and so forth. Everything is included, excepting the guns (you should have all these already). are left in the various Decals folders so you can match the font and size. these Beaus from any others you may or may not have. 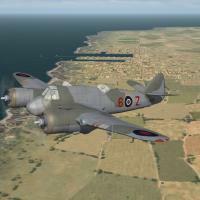 *Note x2: This mod represents RAAF Beau Mk.1cs for SouthWestPacific use ONLY! All markings are decals, and decal randomization is set to TRUE. others you may or may not have. Crest for each is used as the paint chip seen on the Loadout Screen. included. So, please =READ= them!!!. Also, give the "Notes" section a read too. 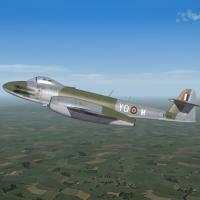 A reskinning and redecaling of the stock 3W Meteor F8 to create a "Stand-In" WW2 era Meteor 3. Yes, we all know there are =SUBSTANTIAL= physical differences between the early and later production marks, but this WILL allow you an RAF jet for anti-diver patrols and causing general mayhem in the closing months of the War. And possibly against some of the Luftwaffe jets recently released, and those still to come. The markings are all decals, representing No. 616 Squadron "South Yorkshire" circa late 1944 thru 1945. These are reused from an old 1stGen mod of mine. The serial numbers are historically correct as they ARE for the F.3 variant. Decal randomization is TRUE. Serials and Plane-in-Group letters for 26 aircraft are supplied. The canopy opens with the Standard Animations Keystroke (Shift/0). 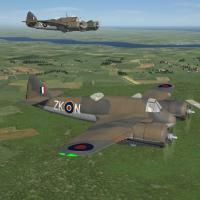 The pilot figure is included, but weapons are NOT, as they reference ALL stock 3W in-game items, with the exception of the RAF500 pound ww2 era bomb. You should already have this in you game via various WW2 weapons packs. My 1stGen 'box art' hangar screen is included, now revamped for SF2. on the aircraft selection drop down menu. This will diferentiate it for those that may (or may not) have the DAT F.3. 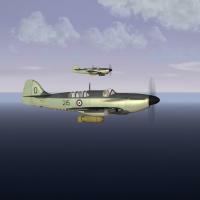 Some extensive rebuilding (ini and skin wise) of Simon Porter's 2005 Beta Release of the Fairey Firefly Mk5 (aka FR.5). The pak is designed to replace any and all other earlier SF/Wo* versions existing. All skins and decals are brand new for this mod; the skins were created via a Home-Grown Template . The template is included. All markings are decals, making it easy to 'swapout' ship ID letters (provided as decals) or skins to create other operational squadrons. The skins are in jpg format. All new dds-format damage textures are included. A new SF2 (semi) compliant FM was created, as was the new Userlist.ini. A "new" SF2 version of my original "box art" hangar screen is included, as is the engine sound. This aircraft has been tested in a Full-5 Merged envoriment, in SF2NA for carrier operations. The RN squadrons use a 'pool' of 25 generic serial/Modex Number decals shared amongst them. I say generic, as they represent FR.5 models from the 1948-55 time frame, but with little hard data available, it's almost impossible to run down "which went to what squadron aboard what boat". The RAN serials, are also 100% historic, but again are limited to those known to have operated aboard HMAS Sidney at some point during the Korean War. There are 19 RAN serial/modex decals. Weapons are NOT included, as they are readily available in The Gunny Pak or the KAW weapons pak, both available here at CA. 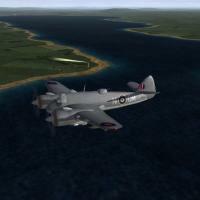 PLEASE remember -- the aircraft lod is still in it's 2005 form (read: the Beta) and many bits are not quite right. As there is no MAX file available, the aircraft "is as it is". Some aerodynamic components exist only in the 'virtual state' as data ini statements. As always, fairly easy to follow install instructions are included. So, please read them. Also, give the "Notes" section a read too. Simon's original Readme is also enclosed. Some modification, tweeks, reskin and so forth for Cocas's fun little Gladiators; this package contains SF2 =ONLY= versions of his Gladiator Mk.2 and Sea Gladiator. RN Markings are rather 'generic'; the first 18 serials are those that HMS Eagle dropped off on Malta, and eventually became the Hal Far Fighter Flight. Those 100% historicaly known to have been used on Malta are marked with a star (*). All skins are in jpg format. Decal Randomization is set to TRUE for all skins. New SF2 hangar screens are included, as is a destroyed model, pilot figure, and engine sound. You shoud have the 303 MGs in your /Guns folder already; it is not supplied herein. Other Royal Navy ships (UK) can be found in the PTO ships pak. As always, fairly easy to follow, yet detailed install instructions are included. So, please =READ= them. Also, give the "Notes" section a read too. Skins remain in bmp format, decal randomization is set to TRUE. Almost all the original decals have been replaced (squadron codes, aircraft ID letters, serials on some, etc) with new builds or repurposed units from my stock of RAF codes. Almost all markings ARE decals. There are no nose arts. Damage textures are in DDS format. Weapons (the RAF bomb set and the 303 gun) are included. All the 1stGen Hangar and Loading screens were either rebuilt to SF2-spec, or created new for this package. They are in jpg format. 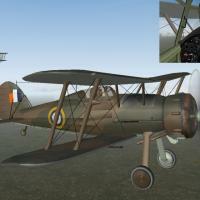 The various inis make use of the 'hide component' or the 'open cockpit' statements to make sure the cockpits are where they're supposed to be. This, unfortunately, prevents their use in SF/Wo* games at the 06 patch level, as stated above. Flight modeling, for the most part, remains as originally issued. See "Changes" in the Notes section for more details. As always, fairly easy to follow, yet detailed install instructions are included. PLEASE read them!!! PLEASE read the "Notes" section for the change list, and other important notations. Also, the Legal Statement has been changed with regards to these aircraft. 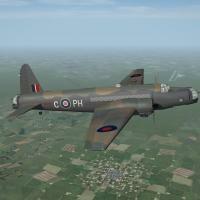 For those that still have the original releases, it's advised you delete the aircraft and decals folders for them; this pak is desinged to replace them in total. 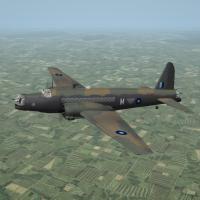 This pak contains a reissue of Veltro2K's WW2 Royal Air Force fighter/bomber aircraft. These are the complete aircraft, with various/sundry changes. Remember, this is the WW2 fighter, NOT the helicopter!!! The skins remain in their original bmp format. All new decals have been created for Squadron Codes, plane-in-group letters, and serial numbers. Serial numbers should be considered 'generic' in nature, as they represent no particular squadron affiliation, but ARE correct for the Whirly. Decal randomization is set to TRUE. 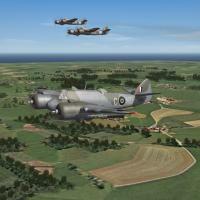 The late RAF MSG/Gr camo skins use the "DefaultStartDate" switch to activiate in Nov, 1941. Operational Service Dates are rounded to the closest whole month. All new Hangar and Loading screens, in jpg format, are included, as are new damage textures in DDS format. New engine sound, pilot figure and the drop tanks are also included. Guns and Bombs are not; they're the standard "RAF" bombs, that you should already have. The canopy operates via the Standard Animation Keystroke , Shift/0. The flight model is (slightly) more SF2-compliant than the original, but as always NEEDS further work by 'those with the know-how'. As always, fairly easy to follow, yet detailed install instructions are included. PLEASE read them!!! PLEASE read the "Notes" section for the change list, and other important notations. Also, the Legal Statement has been changed with regards to this aircraft. For those that still have the original releases, it's advised you delete the aircraft and decals folders for them; this pak is desinged to replace them in total..
**The aircraft herein are released in "AS IS" Condition. There are some issues with the LOD that cannot be resolved. Period. Any and all issues/problems that cannot be solved via ini edits will exist forever, as new models are unlikely to be created**.